The Henry Medal is given for outstanding service, usually—but not always—to someone not on the staff by resolution of the Board of Regents. The medal was created in honor of Secretary Henry shortly after his death in 1878 by William Barber, the Engraver of the U.S. Mint in Philadelphia, and his son Charles E. Barber. The likeness was probably based on the Clark Mills bust of Henry and the latin inscription on the reverse is taken from the 24th Ode of Horace. It reads: "Incorrupta fides nudaque veritas, Quando ullum inveniet parem?" (When shall Loyalty unshaken, and candid Truth e'er find a peer to him?). It is presented to individuals in recognition of their distinguished service, achievements or contributions to the prestige and growth of the Smithsonian Institution. 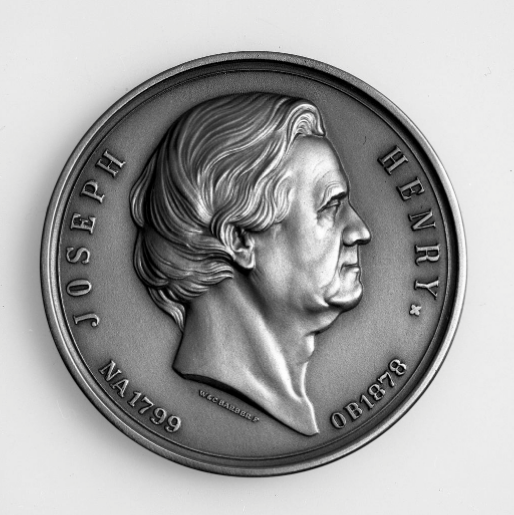 The Henry Medal and the Smithson Medal have similar purposes, however, the Smithson Medal recognizes contributions to history, art, science, education, etc., at a universal level, whereas the Henry recognizes those contributions exclusively to the Institution. 2007 - W. Richard West Jr.